One common strategy when looping problematic organ samples is to employ a cross-fade. This is an irreversible audio modification that gradually transitions the samples leading up to the end of a loop to equal the samples that were leading into the start. The goal is to completely eliminate any sort of impulsive glitch and hopefully also create a “good spectral match”. While the ability to eliminate glitches is possible, creating a good spectral match might not be so simple. A voiced/correlated/predictable component (choose your word) which represents the tonal part of the sample. Strictly speaking, the tonal component is not entirely predictable – there are continuous subtle variations in the speech of a pipe… but they are typically small and we will assume predictability. An unvoiced/uncorrelated/unpredictable component which represents the pipe-noise of the sample. Both of these components are necessary for realism in a sample. The following image shows a cross-fade of two entirely correlated signals. 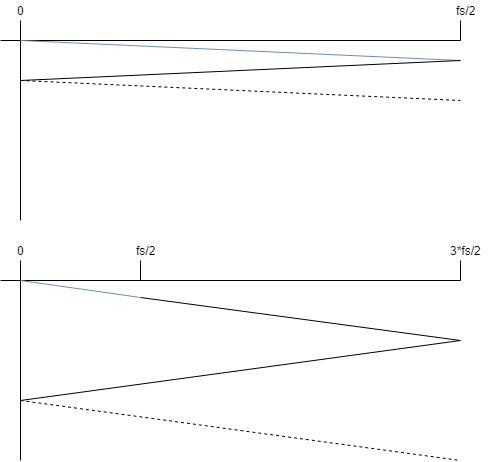 The top picture contains the input signals and the cross-fade transition that will be used, the bottom contains the input signals with the cross-faded signal overlaid on top. There is nothing interesting about this picture: the two input signals were the same. The cross-fade transitions between two identical signals i.e. 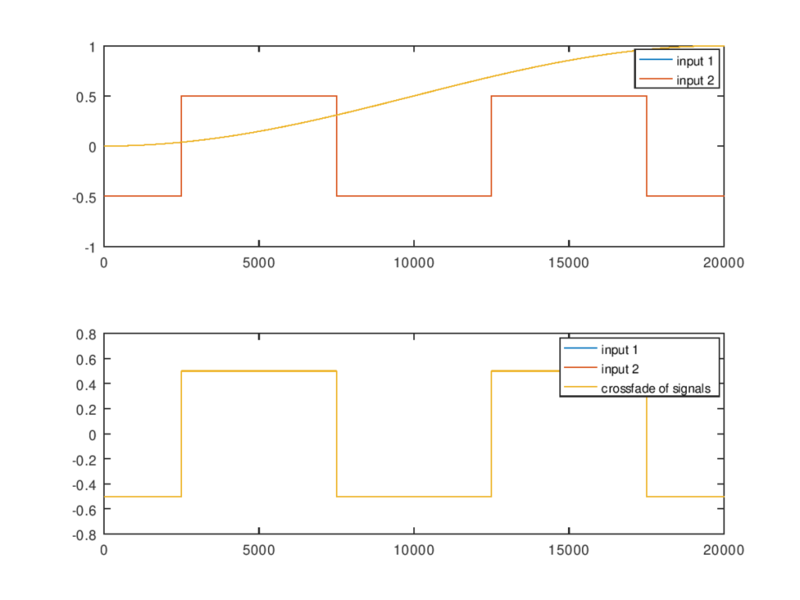 the output signal is equal to both of the input signals. The next image shows a cross-fade of the same correlated signal with some uniform white noise overlaid on top. What is going on in the middle of output signal? It looks like it’s been attenuated a little bit and doesn’t appear to have a uniform distribution anymore. This final image is a cross-fade purely consisting of two uniform random signals to add some more detail. Listen for the level drop in the middle. If you can avoid cross-fading – avoid it. If you cannot avoid cross-fading – make the cross-fade as short as possible (milliseconds) to avoid an obvious level-drop of noise during the transition. This entry was posted in Modelling, Signal Processing, Virtual Pipe Organs on 16th February 2019 by nick. There is a tool which is part of my Open Diapason project called “sampletune” which is designed to allow sample-set creators to tune samples by ear and save the tuning information back into the sampler chunk of the wave file. The utility plays back a fixed tone and there are keyboard controls to shift the pitch of the sample up and down until the beats disappear. I was hoping to prototype a sawtooth wave as the tuning signal, but realised during implementation that creating arbitrary frequency piecewise-linear waveforms is actually somewhat a difficult problem – fundamentally due to aliasing… so I parked that idea and ended up summing several harmonic sinusoids at some arbitrary levels. Recently, I was thinking about this again and set about solving the problem. It was only in the last couple of weeks that I discovered tools like Band Limited Impulse Trains (see link at bottom of post) which seem to be the common way of generating these signals. These are fundamentally FIR techniques. I approached the problem using IIR filters and came up with a solution which I think is kind-of interesting – please let me know if you’ve seen it done this way so I can make some references! If we generate a piecewise linear waveform wave at a frequency which is not a factor of the sampling rate, we will get aliasing. In fact, we can work out the number of shifted aliasing spectrum copies which we can expect to see by taking . If is irrational, we have an infinite number of copies. Let’s make the assumption that more-often than not, we are going to be generating a very large number of aliases. The next assumption we are going to make is that most of the signals we are interested in generating have a spectral envelope which more-or-less decays monotonically. With this assumption, we can say: if we generate our signal at a much higher sampling rate, we effectively push the level of the aliasing down in the section of the spectrum we care about (i.e. the audible part). Below is an image which hopefully illustrates this; the upper image shows the spectral envelope of the signal we are trying to create in blue, all of the black lines which follow are envelopes of the aliasing. The second image shows what would have happened if we created the same frequency signal at three times the sampling rate. The interesting content again is in blue and everything in black is either aliasing or components we don’t care about. What we can see is that by increasing the sample rate we generate our content at, we effectively push the aliasing components down in the frequency region we care about. Generate them at a sample rate of where is some large number. Filter out the high-frequency components above using some form of IIR filter structure. Decimate the output sequence by a factor of to get back to (which we can do because of the previous operation). Now that we’ve postulated a method, let’s figure out if it makes any sense by answering the questions “does it have an efficient implementation?” and “does it actually produce reasonable output for typical signals we may want to generate?”. Does it have an efficient implementation? For clarity, let’s just consider a single update of the system state where represents the “previous state” and represents the first sample of new data we are pushing in. We can derive an expression to insert two samples in via substitution and from that derive expressions for inserting groups of samples. We’re interested in inserting groups of samples which form linear segments into our filter. So let’s replace with some arbitrary polynomial. This gives us some flexibility; we need only a polynomial of zero degree (constant) for square waves, first degree for saw-tooth and triangle – but we could come up with more interesting waveforms which are defined by higher order polynomials. i.e. The first output sample ( ) is only dependent on and the previous state. If we restrict our attention to always getting the value of the first sample, we don’t need to do any matrix operations to get an output sample – just vector operations. All of the parenthesised bits in the equations have no dependency on the coefficients of the polynomial we are inserting into the filter – they only depend on the number of samples we want to insert ( ), the system state matrices and/or the index of the polynomial coefficient. This means that we can build lookup tables for the parenthesised matrices/vectors that are indexed by and the polynomial coefficient index and effectively insert a large number of samples of any polynomial into the filter state with a single matrix-matrix multiply and a number of scalar-vector multiplies dependent on the order of the polynomial. It’s looking like we have an efficient implementation – particularly if we are OK with allowing a tiny (almost one sample at ) amount of latency into the system. Below is a screen capture of Adobe Audition showing the output of a small program which implemented the above scheme. The system is configured using an elliptic filter with 1 dB of passband ripple and a stop-band gain of -60 dB. Waveform with frequency of 600*pi Hz. 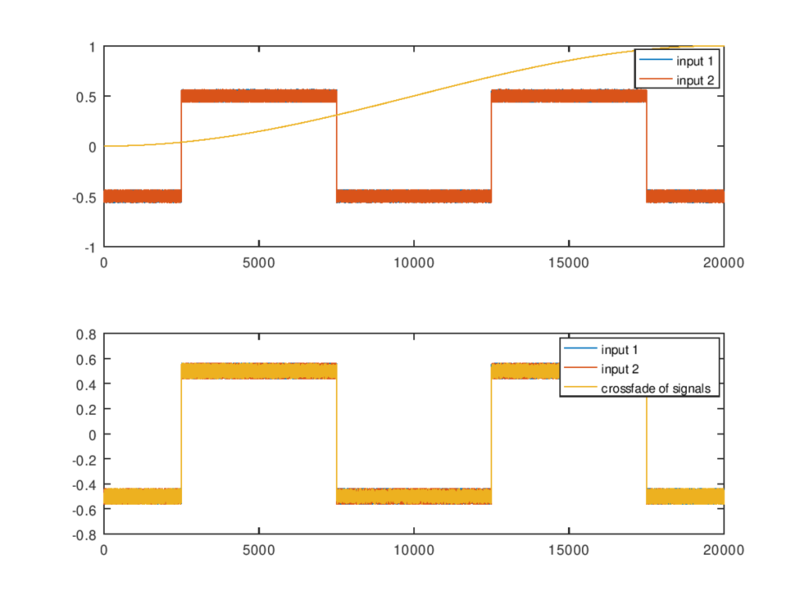 Left channel generated using naive modulo, right generated using the proposed scheme. The spectrum of the left channel is green. The waveform has a frequency of which is irrational and therefore has an infinite number of aliases when sampled (this is not strictly true in a digital implementation – but it’s still pretty bad). We can see that after the cutoff frequency of the filter, the aliasing components are forced to decay at the rate of the filter – but we predicted this should happen. Below is another example using an 4th order Bessel filter instead of an elliptic filter. This preserves the shape of the time-domain signal much more closely than the elliptic system, but rolls off much slower. But the performance is still fairly good and might be useful. T. Stilson and J. Smith, 1996]. This entry was posted in Uncategorized on 23rd March 2018 by nick. 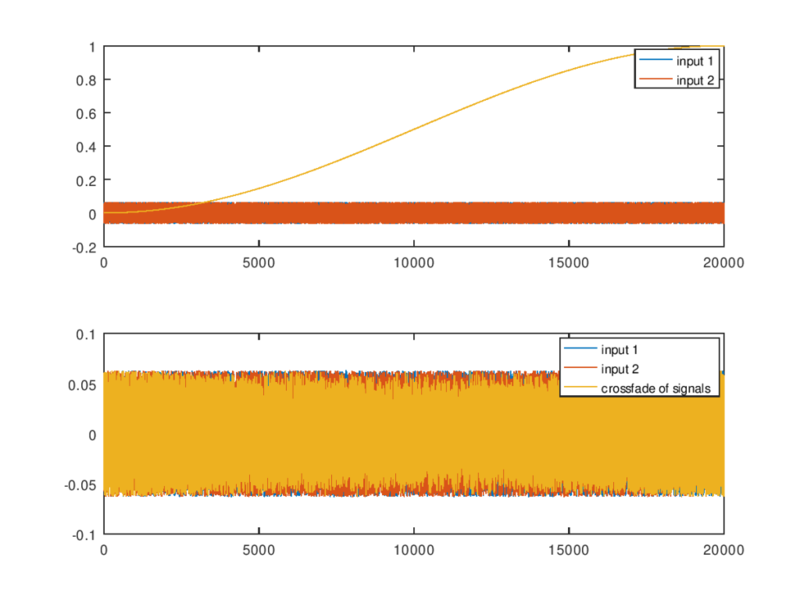 Generating multiple low-quality random numbers… fast. Load wave file from disk into memory. 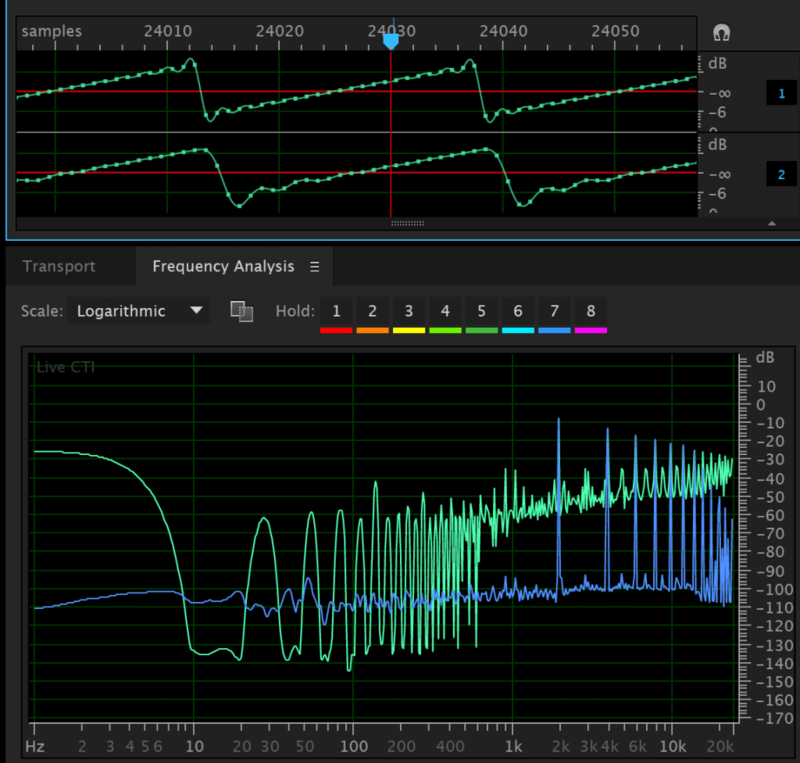 Apply a linear phase filter to all loaded samples (this is to compensate for the response of the resampler which occurs during playback). 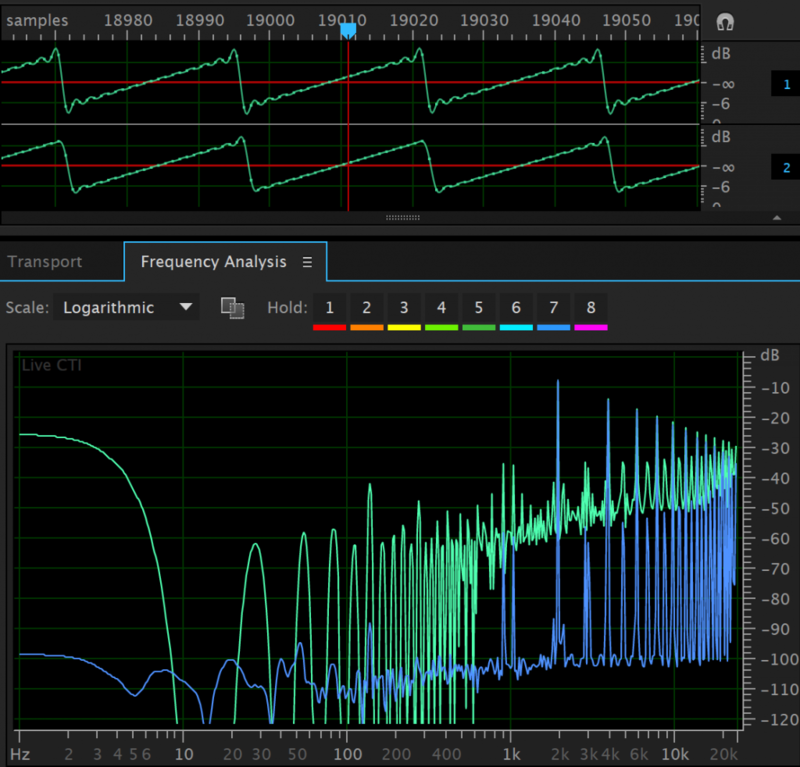 Normalise and quantise the filtered audio using TPDF dither. The normalisation ensures that we use the full 16-bits of precision for each sample. Obviously, the scaling coefficient is stored along with the sample to ensure we play the content back at the intended level. All of these steps are done across multiple threads to maximise performance (there is one thread that is reading audio files from disk ready to spawn threads which apply the filter and requantise the data)… this is one of those times where the speedup was roughly linear with the first couple of threads which I added. Anyway, back to the profiling: I was expecting that the vast majority of the cycles would be spent in the application of the filter, but this actually turned out not to be the case. The dithering and re-quantisation of the audio – which I assumed would be cheap – turned out to be chewing cycles on the order of 30% of the load time (all of my profiling was done on a mid 2014 MacBook Pro with an i7 processor). There were multiple things which I did to speed it up, but I think what I pushed in this change list was the most interesting one – so what follows in this blog is a bit of a write up. See the code in the original commit for a better understanding of what’s going on. There is a hefty comment explaining the fixed-point dithering process. This entry was posted in Uncategorized on 19th February 2018 by nick.